Eloise Beard, 94, entered into eternal peace on Sunday, December 17, 2017, at Chriswood Assisted Living in Booneville. She was born on April 20, 1923, in Prentiss County in the Marietta community to Zeb Thomas Fortner Sr. and Ollie Barnes Fortner. She married Leonard Beard who preceded her in death on June 22, 2005, after 60 years of marriage. She was a loving mother to her son and a typical doting grandmother to her granddaughter and great-granddaughter. 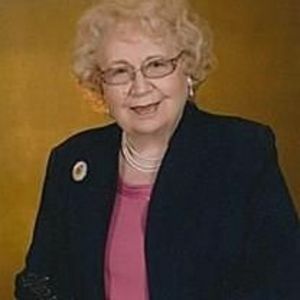 She was a faithful member of the Booneville Church of Christ as long as her health allowed. She loved her church family. In her younger days she looked forward to Vacation Bible School every summer, because her granddaughter sometimes spent that week with her grandparents so she could attend VBS with her grandmother. For several years Eloise and her sister were in charge of refreshments for VBS. Because she had a compassionate heart, she loved to prepare food for bereaved families who had lost a loved one. Eloise was an outstanding cook and collected lots of recipe books over the years. She and her husband also loved growing fresh vegetables and sharing with friends and neighbors. She worked hard every summer canning and freezing their produce. Every spring she planted all kinds of flowers in her yard until she was in her late 80's. She loved fashion and shopping for pretty clothes. In the early 1980's she and her sister made ceramics and gave them as gifts to family and friends. When she could still see well, she also enjoyed painting, needle point, and reading. nephews; and special friends Maggie Hester, Ruby Cain, Pat Gray and Marie Roberts, who was also her hairdresser for many years. In addition to her husband and parents she was preceded in death by two sisters Faye Caldwell and Irene Wright; and two brothers Mack Fortner and Zeb Thomas Fortner Jr.
A celebration of life service will be held at 12 noon on Friday, December 29, at McMillan Funeral home with Ministers Jim Estes and Dr. Greg Pollock officiating. Visitation will be from 10 a.m. until service time at noon. Burial will be in Booneville Cemetery. Nephews and great-nephews will serve as pallbearers. Memorials may be made to The Caring Cooks, Booneville Church of Christ, P.O. Box 28, Booneville, MS 38829.